Can signals travel “backwards” in the sensory pathway? So again, my understanding is that sensory nerves are 1-way sensors, and that once they fire a signal, its 1 and only ultimate destination is the brain. So, as a precursor to my question, if anything I have stated is incorrect, please begin by correcting me! I read that pinched nerves in the back and neck can cause neuropathy ("pins and needles") all over the body: hands, feet, face, etc. But how can this be? If my understanding of the sensory pathway is correct, then a pinched nerve in one's neck should only send "pins and needles" signals directly to the brain; it should not at any point forward/relay signals on to any other areas of the body. To state that a pinched nerve in one's neck could possibly cause neuropathy in their arm, then that insinuates there is some connection between the pinched "neck nerve" and the nerve(s) in the arm that are experiencing the pins and needles sensation. In fact, unless I completely misunderstand the entire sensory pathway and how pain signals transmit, this implies that a pinched nerve sends signals out to the spinal cord, down the spinal cord and into, say, an arm, and that the sensory receptors in the arm subsequently react to these signals. How is this possible?!? Is there some kind of feedback mechanism at play where nerves in the neck and back can relay signals on to other areas of the body, instead of just feeding directly into the "spinal cord => brainstem => cortex" pipeline? Reverse signals (dendrite -> axon) do occur in neurons, and are called back propagating action potentials (bAPs). However, whatever role bAPs play in the nervous system at large is subtle/small enough that we don't really understand them at all. In any case, as @luigi points out, pinched nerves don't have anything to do with bAPs. The reason why a pinch in one place (the neck) feels like it has an effect in another place (the arm) is because some neurons trace long (on the order of several feet) pathways through the body. Ultimately, the sensory input of everything below your head passes through neurons in your neck at some point. If there is a pinch in the neuron in your neck that relays sense information from your arm, that neuron in your neck can activate spuriously, even in the absence of any stimulus acting on your arm. In that case your brain will interpret the spurious activation of that neck neuron as being the result of some kind of strange arm stimulus, and so you feel pins and needles. See here for more information on the sensory cortex in your brain and the "sense image" it maintains of your body. The part marked "proprioceptors or mechanoreceptors" is what's buried in your skin. If you poke a mechanoreceptor, it evokes a signal in the neuron marked "first-order". 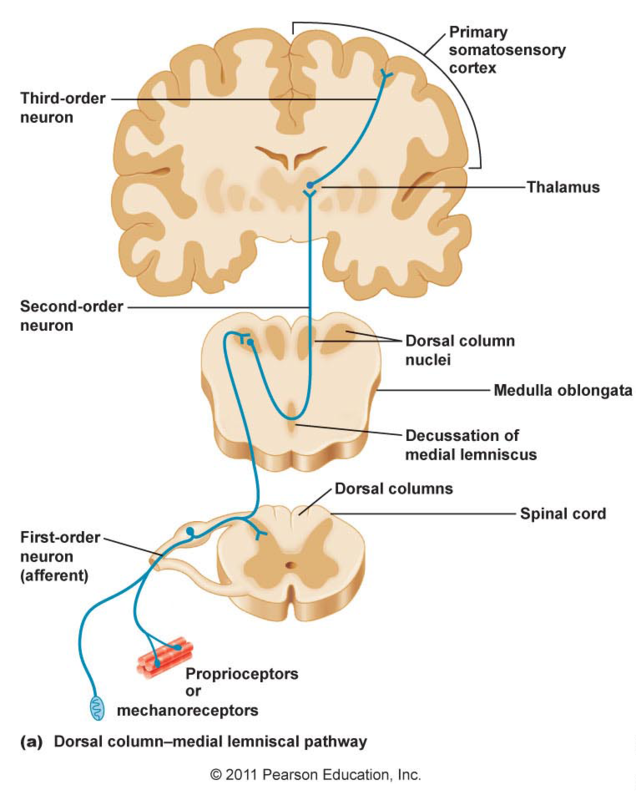 In some cases, that first-order neuron will reach all the way to brainstem (as in the picture above), and in some cases that first-order neuron will interface with an intermediate neuron in the spine, but the effect is the same in any case. A first-order neuron stimulates a second-order neuron, which in turn stimulates a third-order neuron, etc., all the way until the original signal arising from the mechanoreceptor reaches the somatosensory cortex. A pinch in any of those first, second, etc. order neurons will potentially send spurious signals to the somatosensory cortex. Rereading your question, I think a lot of the trouble that you're having has to do with your understanding of how the brain assembles sense information. In order to feel pain in your arm, it is not necessary for anything to be happening to the arm itself. Your arm could be perfectly healthy and normal, but as long as your brain is receiving a signal equivalent to the one produced by a damaged arm you will still feel the same sensation of pain. Not the answer you're looking for? Browse other questions tagged human-biology human-anatomy brain pain central-nervous-system or ask your own question. SPINAL CORD: Do the axons from white matter synapse with the cell bodies in grey matter? How and where do nerves share pathways to the brain? Physiologically, how can stress/anxiety cause neuropathy? Why are spinal nerves considered a part of PNS while the spinal cord is a part of CNS?